In 1921, “The Sultan of Swat” Babe Ruth proved what most baseball fans already knew, that he was no ordinary mortal, when he submitted to undergo a series of tests conducted by Columbia University of New York to determine his athletic and psychological capability. The Bambino was 90% efficient compared with a human average of 60%. His visual response time was approximately 12% faster than average. His hearing response function was at least 10% faster than an ordinary man. His nerves were steadier than those of 499 out of 500 persons. In intelligence, as demonstrated by the quickness and accuracy of understanding, he was approximately 10% above normal. 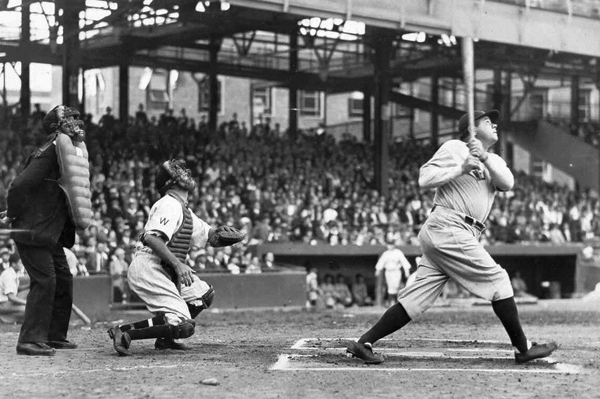 When he slammed 60 home runs in 1927, The Babe accounted for 14% of all home runs in his league that year. For a player to tally 14% of all home runs today, he would have to hit over 300 home runs in one season. Ruth hit three homers in a World Series game twice. He smacked 340 solo shots, 252 two-run dingers, 98 three-run taters and 16 Grand Slams. 51% of his homers came with men on base, 16 homers left the park in extra-innings, 10 were the inside-the-park variety, and only one came as a pinch-hitter. He connected for three homers on May 21, 1930, with New York, and with the Braves on May 25, 1935, including the final homer of his career, off Pirate Guy Bush. He hit 15 long balls as a pitcher… Collected RBIs in 11 consecutive games in 1931... and collected more RBIs than games played in six seasons. (1921-27-29-30-31-32). Was the first player to hit three home runs in a single game in the AL and NL. Ruth had six five-hit games in his career... Scored five runs in a game twice... stole home 10 times… and On April 20, 1926, he drove in eight runs. Now that’s what we call a Superhuman Superstar!